The Lusitano Horse is said to be the world’s best-kept secret in the horse breeds division. They are powerful and graceful and are renowned for their noble character and willingness to please. They are also enthusiastic and kind and work well with any level of rider or trainer. Plus, they possess a higher than average intelligence, that’s why they are considered a symbol of status for their owners. Ever heard someone call a horse a PRE – and wonder what they meant? PRE is an acronym for Pura Raza Espanola – or simply Pure Spanish Horse. Lusitanos are popularly called the PRE. Their close neighbours, the Andalusian are also popularly called the PRE. The Lusitano has been used over and over in movies – they are marvelous and are the perfect majestic horses. The Foundation for Pura Raza Espanola lists over 100 horses that starred in movies, and we are pretty sure these are not all. As the original Iberian horse from Spain and Portugal, the Lusitano is thought to be one of the oldest horse breeds in the world. Their origin dates back to 1700BC, evidenced by archaeological cave paintings in the Escoural Caves of Alentejo. Spanish colonists brought the Lusitano together with the Andalusian and other Iberian breeds to the Americas, and therefore the Lusitano can claim to be a founding father of many American breeds including Mustangs, Rocky Mountain Horse, etc. Until the 1960s, the Lusitano was considered the same as the Andalusian breed, and even today in some parts of the world, they belong to the same breed society. In Portugal and Spain, however, they are now recognized as different breeds and the Lusitano is slowly creeping out of the shadows of its more famous neighbour. Today, the Andalusian has a straighter head profile and carriage leaning towards beauty and elegance for dressage purposes while the Lusitano has a rounder head and body, coupled with lightning quickness and athleticism and is mainly used in the bullring. The Lusitano is mostly used in the bullring in Portugal and other bullfighting countries. The bulls are fought from the horses back and they are not killed in the ring. They are challenged by both the horse and the bullfighter. Only the best Lusitano horses can take participate in bullfights, this is because they need to have the skill and agility to dodge the horns of the bull during the fight. Ridden by Spain’s Juan Antonio, Guizo was the first Lusitano to win an Olympic medal. Rubi, on the other hand, was the first Lusitano to qualify for an Olympic kur after being ridden by Goncalo Carvalho. Recently, all four members of the 2016 Rio Olympics Brazilian dressage team rode Lusitanos. Lusitanos have what is known as a sub-convex profile or a Roman nose. This is a trait that is genetically transferred and allows the horse to have the ability and skill to be a mounted single combat horse. Two particularly famous families, the Viega and Andrade have been breeding the Lusitano for years. It is common for Portuguese children to learn to ride on Lusitanos. This is because they as much as they are spirited, they are sane and would never buck or try to get a rider off their back. A Lusitano wouldn’t be expected to reach the height of its training until it is 12, and most of them continue to perform well into their 20s. 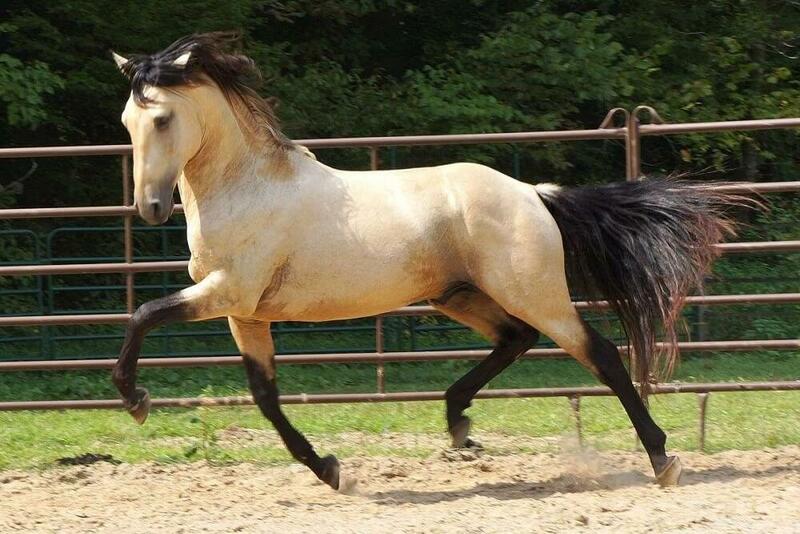 Most Lusitanos are bay and grey- in fact, 80 percent of the Lusitanos are grey. However, their registry allows all solid colours including palomino, chestnut, black and dun. In the past, some Lusitanos were even spotted, but these are rare today. The Lusitanos were named after Lusitanian; the name the Romans gave to the region of the Iberian Peninsula which roughly connects to the modern day Spain and Portugal. Most Lusitanos stand at around 15 to 16 hands high and weigh between 700 to 1100 lbs. That video was pretty cool to see. The horses are so graceful even when being starred at by a bull! My husband and I are hoping to get a horse for our daughter, and the Lusitano seems like the best breed for her due to their grace, power, and personality. The movies, as you mentioned the breed often features, is where our daughter actually first learned about them, and the fact that there are over a hundred of them shown in movies by just one foundation is astounding. It’s good to know that they are, in fact, renowned for being calm and gentle, as you said, so we can be sure that our daughter’s horse will never try to buck her off. Lusitanos are **NOT** called PRE. PRE are Spanish Purebred. 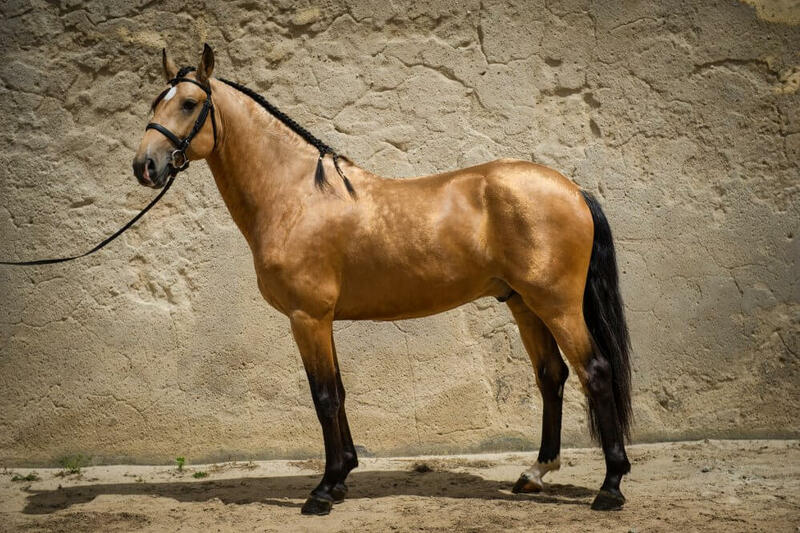 Lusitanos are PSL, i.e. Portuguese Purebred. Both are sometimes called Andalusians although it’s inaccurate because Lusitanos come from Portugal, not from the Spanish province of Andalucia. Lusitanos are, as Isobelle says, PSL which is the acronym for Puro Sangue Lusitano. And as regard Andalusians, the rest of the world drives Spanish breeders mad. Andalusion refers *only* to PRE born in Andalucia, nowhere else, not even other Spanish provinces. The Lusitano is Portuguese and not spanish!!! The breed is Puro Sangue Lusitano (PSL) not PRE. PRE stands for Pura Raza Espanola (all over spain). The andalusina is a horse born in Andalusia (a province of spain) and are generally refered to the PRE born in Andalusia. Puro Sangue means Pure Blood. THIS IS A VERY IGNORANT AND POPULAR POST!